International airlines fly from South Africa’s international airports daily offering access to the rest of the world for us and an entry into Africa for many foreign businessmen and tourists alike. There are a number of international airlines that fly to and from South African airports. Below, we’ve compiled a list of the major international airline operators that serve flights to South Africa. O.R. Tambo International Airport, Johannesburg to Botswana. O.R. Tambo International Airport, Johannesburg to Mauritius. O.R. Tambo International Airport, Johannesburg to Namibia. O.R. Tambo International Airport, Johannesburg to Zambia. O.R. Tambo International Airport, Johannesburg to Zimbabwe. O.R. Tambo International Airport, Johannesburg to Atlanta, Georgia, in the U.S.
Delta Airlines also provide connecting flights from Cape Town to Johannesburg. O.R. Tambo International Airport, Johannesburg to Addis Ababa, Ethiopia. O.R. Tambo International Airport, Johannesburg to Nairobi, Kenya. Swiss International Airlines fly from O.R. Tambo International Airport, Johannesburg to Zurich in Switzerland. Thai Airways provide a direct flight from O.R. Tambo International Airport, Johannesburg to Bangkok in Thailand. Turkish Airlines provide direct flights from O.R. Tambo International Airport, Johannesburg to Istanbul in Turkey. They also provide connecting flights from Cape Town to Johannesburg. irgin Atlantic Airways offer direct flights between London and O.R. Tambo International Airport, Johannesburg throughout the entire year. Air Mauritius serve flights from Cape Town directly to Mauritius. Air Namibia serve direct flights to Windhoek, Oranjemund, Lüderitz, Walvis Bay, all of which are cities in Namibia. Air Botswana serve direct flights to Maun in Botswana. Air France provide regular flights from Cape Town International Airport to Paris, France. 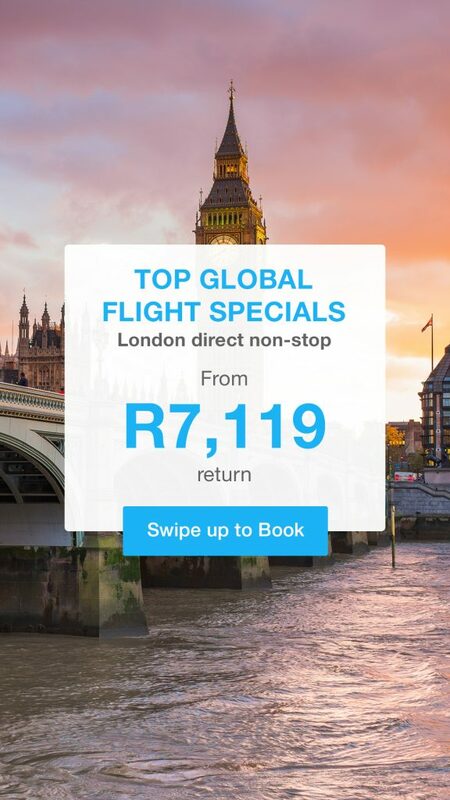 British Airways serve flights from Cape Town International Airport to London Heathrow. Serve direct flights from Cape Town to Nairobi in Kenya. KLM offer flights from Cape Town to Amsterdam in Holland. Malaysia Airlines serve flights from Cape Town to Kuala Lumpur in Malaysia and Buenos Aires in Argentina. Qatar Airways fly from Cape Town International Airport to Doha, India. Singapore Airlines offer direct flights from Cape Town to Singapore. Turkish Airlines fly from Cape Town to Istanbul in Turkey via O.R. Tambo International Airport, Johannesburg. Virgin Atlantic offer flights from Cape Town to Heathrow in London, United Kingdom.